Norlynn is a very old village, north of the Sparkling Sea, south of the Great Riverlands, and east of the Wildlands. It is populated by around three hundred villagers, and to passersby would appear to be nothing more than a hub for the local farmers and fishermen. Those who know of the local lore, however, know that Norlynn is anything but a simple trading hub. While most of the villagers who live there are relatively average folk, Norlynn is home to the arcane order known as the Magicker’s Guild, and, more importantly, the ancient building known to most simply as the House of Doors. Norlynn is an epic fantasy location for the Entropic Gaming System. 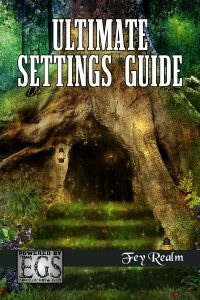 Designed as a town to be set within any setting or campaign, it’s usable at any character rank and can even provide a new home for the player characters. With a slight change of flavor, Norlynn can also be placed in any dark fantasy setting. A city with map and important places. Norlynn is a complete, standalone location. It only requires the Entropic Gaming System core rulebook.